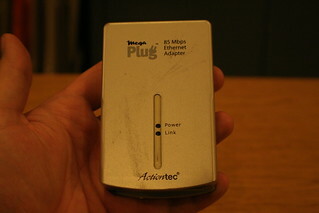 I'll start with the single ethernet port device. 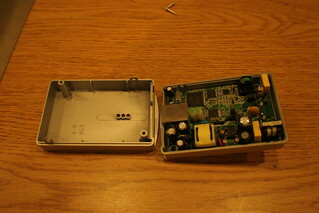 After removing the two screws, there's a pair of plastic fins you can see below. Just squeeze the case to get them loose. Once inside, we see a clear delineation between the powerline networking side, and the low-voltage and ethernet side. 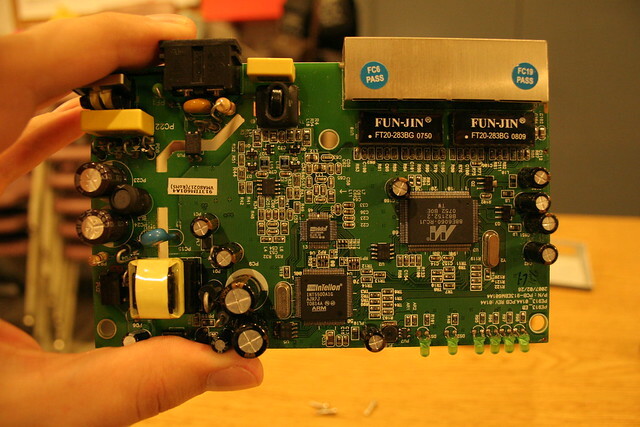 There's an INT5500 on the board, which is standard for the 85Mbps devices, along with some companion chips. Nonvolatile storage for the INT5500 is provided by the serial flash near the crystal. 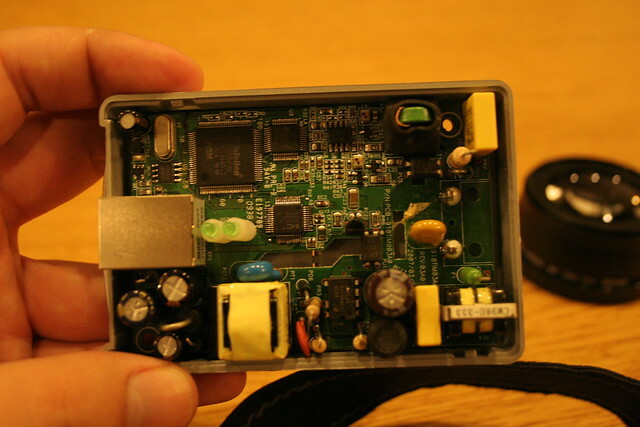 There is little public documentation on the INT5500, but it is more than a simple bus converter. 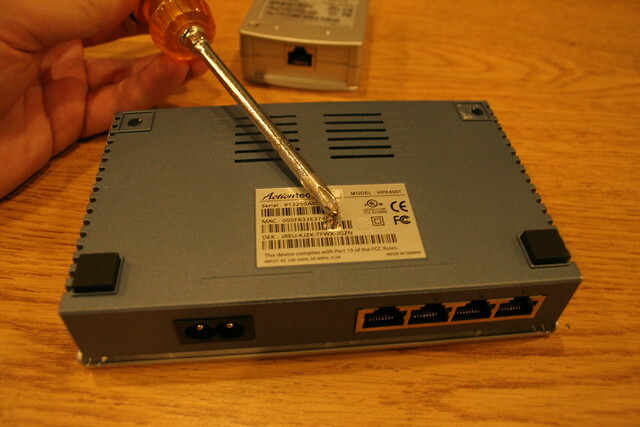 The INT5500 can also communicate over ethernet. This is primarily used to configure encryption for the powerlink links, which is very useful if you live in an apartment or duplex. 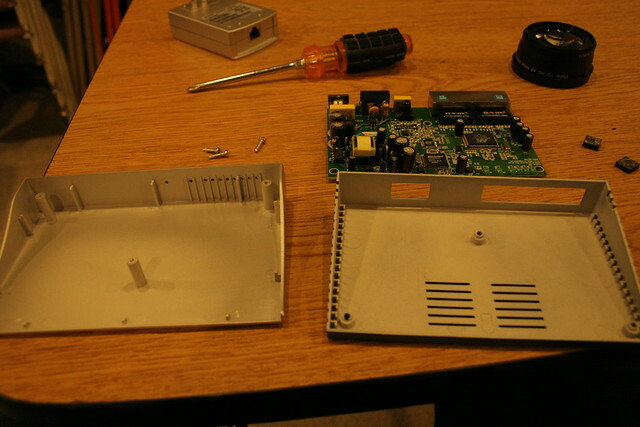 The AC fins are soldered directly to the PCB, so I did not take photos of the reverse of the board. Now on to the larger device. Pull the three screws. One is hidden under the sticker, and two are under the furthest feet. Once the screws are released, the whole case flips open like a clam. The front edge acts like a hinge. Once the top case is off, the board slides out easily. The front of the board is where all the good bits are. Backside photos are up on flickr too though. 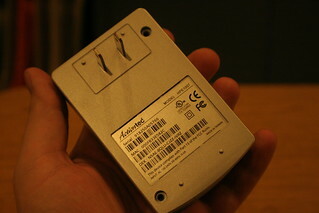 The same INT5500 chip and friends are present for powerline network conversion. 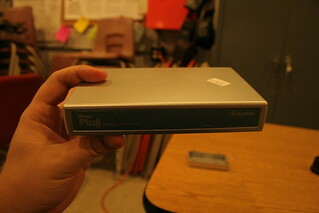 In addition, the 4-port switch is provided by a Marvell 88e6060 6-port switch chip. The 88E6060 is designed for precisely these switching applications - it has 4 ethernet ports configured for external access and two ports that support RMII or MII interfaces for interfacing to a microcontroller. That about wraps it up. These units appear to work pretty well, but only if placed on the same half of the power lines. Usually AC power comes in to a house at 220 Volts that is generated by two opposite phases. These phases are split to make 110 Volt circuits for different parts of the house. However, I suspect that if you have a pair of utility sockets where your power comes in to the house, you may be able to place a powerline network adapter on each phase, and connect them with ethernet to ensure a good connection.